Jerith Patriot Steel Double Gate Kit w/Hardware | Hoover Fence Co. The Jerith Patriot™ Double Gate Kit is designed to work with both 4 gauge and 6 gauge fence sections. This kit allows you to build up to a 12' wide double gate from two sections of fence (purchased separately). Gates smaller than 12' wide require cutting each fence section to desired width. Note: Hardware that comes with gate kit is intended for mounting to post, if mounting to a column request hardware for column mount. Gates are NOT sold assembled. Preassembled gates are not available in this style fence. Gate Kits are available to construct your gate to whatever width needed, up to 6' wide. When you purchase a gate kit, it comes with the two gate uprights (the sides), hinges, connecting hardware (corner castings to attach uprights to rails) and latch. You must also purchase a matching fence section to complete the gate. Widths smaller than 6' require cutting the fence section to desired width. This can be done easily with a hacksaw. Be sure to cut the rails in a matter to keep the ends square. Cut wire sections of the fence should be touched up with available brush-on paint to keep from them from rusting. Double gates can be made up to 12' by purchasing double gate kits and two sections of fence. 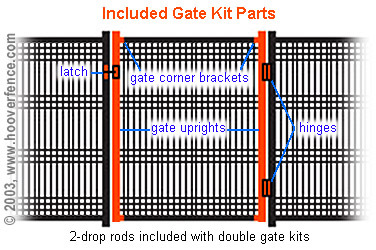 Two drop rods are included with double gate kits. Assembling a gate is not extremely difficult and requires no special tools or skills. Gates are rated to support a 300 lb. vertical load on the latch side of the gate without collapsing. What should the distance be between posts when mounting an ornamental wire gate? The size of the gate should be smaller than the space between your posts to allow for the hinges and latch. If you have a 36" wide gate opening between posts, your gate should be constructed 1-1/4" smaller or 34-3/4". However, when mounting to walls or columns this is not true. For column mounting, figure 1" extra for the gate opening size. The reason is that the latch catch (striker) must be mounted on the inside face of the column. A stringer is used to mount the catch on. The stringer is first attached to the column and the catch is attached to the stringer. Is the hardware included with the purchases of a gate kit? Yes, all the hardware is included with the gate kits. Included are the hinges, latch, gate uprights (sides) and brackets used to assemble the gate parts to a fence section (not included). Double gate kits also include two drop rods. How should I determine the gate size I need? Lawn Care Maintenance Equipment and Pedestrian Gates: Typically 3' wide gates are sufficient for push mowers; riding lawnmowers usually require 4-5' wide openings. Wheelbarrows can require a 4' wide opening. Always measure these items and any others you want to push, pull, and carry through the gates. Also keep in mind doors in most houses are only 36" wide. All sorts of large cumbersome items can fit through these openings. Driveway Gates and Vehicle Access Gates: Consider that most highways are only approx. 10' wide. People have no trouble driving 65 MPH+ on a 10' wide road. Most driveway gates are 10' or 12' wide, however some are larger. Larger driveway gates are often installed because a vehicle will not or cannot pull in straight; vehicles will be turning as they drive through the gate opening. This is especially important for vehicles pulling trailers and boats. Semi-Annual Traffic: Frequently our customers have wanted larger gates for the septic tank truck or to be prepared in case they need to get a backhoe in for repair. This is excellent forethought, however a large gate can be unnecessary and add extra cost to your project. In such instances where a gate only needs accessed a couple times a year, consider installing 2-3 removable sections of fence. This can be done at a modest cost and it is not any more laborious than installing the fence to begin with. There is more than one way to do this, the method is dependent on the style of fence being installed. 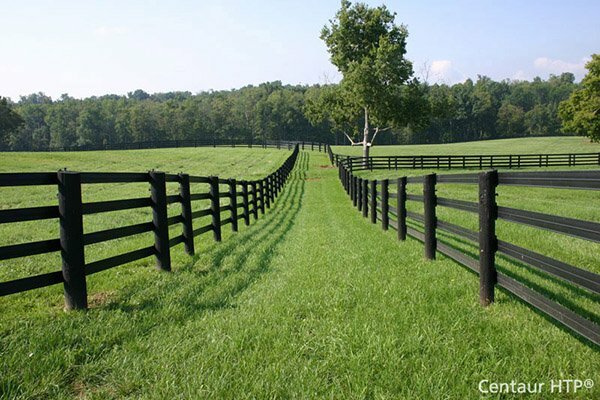 For wire fence, it is frequently done by cementing sleeves in the ground flush with grade in lieu of the posts. These sleeves, which can be made from galvanized steel, aluminum, or treated lumber, are approx. 18" long. They are slightly larger than the fence posts so that the fence posts can slide into them. Shim post(s) if necessary. Once fence post sleeves are cemented in the ground, install the fence as usual only for one or two posts, slide these into the sleeves versus cementing in ground. To remove section of fence, detach the rails fastened to the outside of the movable posts and lift the fence section and posts out of the ground. To sum, gates are the only part of the fence which move. They are also the only part of the fence which tends to get abused. Years of experience have taught us that the smaller the gate - the better. Smaller gates will last longer, be less finicky years later, and cheaper to replace should they ever fail or get damaged. As far as expense is concerned, in many case it makes very little difference. For example, if you need 10' of fence with a man gate, you can order 7' of fence with a 3' gate or 6' of fence and a 4' gate - the net result is you need to cover 10'; you can install less gate and more fence or vice versus. Plan locations and widths of gates to eliminate waste and cutting sections down to size.